And before we even realize it, it’s almost Christmas! We have been trying to publish this post for days; we prepared the photos, tested the recipe to make the proper measurements and adjustments, wrote most of the text and then….we had to pause: the workload at the office, for both of us, was immense. Instead of getting in the mood for the Holiday Season, we had to deal with various urgent (they’re always urgent aren’t they?) issues. Moreover, we got a bit sick from flu! So, we are posting this right before Christmas, instead of 10 days before. Hopefully, though, you’ll be able to try this recipe in the Holiday Season. If not, it’s still a popular recipe all year round. The recipe we are posting this Holiday Season is the one for Diples. 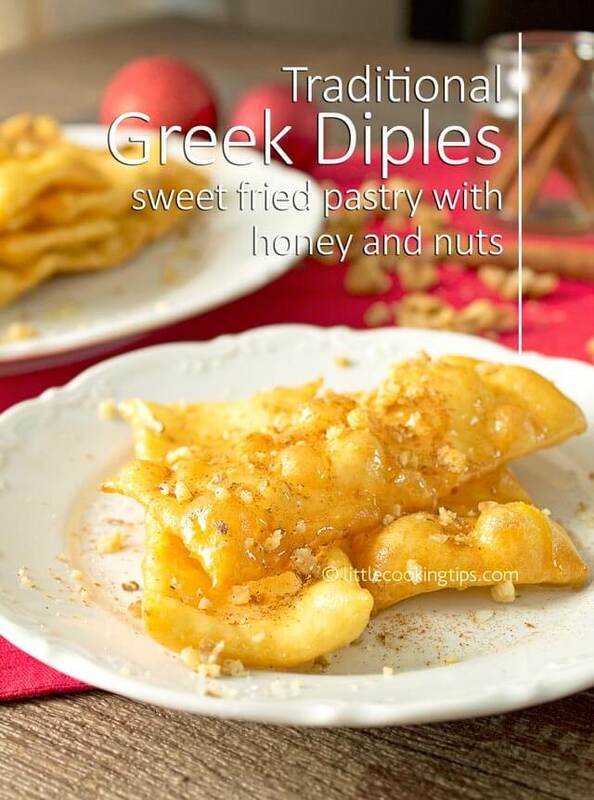 Diples (pronounced thee-ples) is a traditional, festive dessert, that’s mostly served at the Peloponnese but is also popular thought Greece. A similar variation in Crete is called Kserotigana (meaning fried until dry). The word diples literally means “folds”, because one folds a thin sheet of dough while it’s being fried in a pan. Diples are very popular during Christmas but are also served at weddings, baptisms or other celebrations. Our version for diples is the easiest one. We’ll show you how to make the dough and how to fry them in simple, rectangle-shaped strips. We won’t mess with actually folding the strips in the pan, as this takes quite a bit of practice and it would be hard for someone who never tried diples before to understand how to make them through a blog post. So, this is the simplest version. The dough is the same –of course- we use in the folded diples as well; the only difference is that we won’t fold them. We’ll make delicious, crusty sheets of fried dough, scented with cinnamon and orange. In our version diples look a bit like Mexican Buñuelos. Only they are rectangle-shaped and not round. The process for making them is also similar to Buñuelos, so if you tried them before, you ‘ll easily follow the instructions in this recipe. We won’t use ouzo, which is a liquor often used in diples. We want this recipe to be alcohol-free so that your children can enjoy it as well. We remember ourselves as kids, running to the countertop to get some of the diples that had been just prepared by our moms. The key to making perfect diples is to roll the dough out, really thin. The thickness should be 2 mm – 1/16in or less. This way, when we fry our little strips of dough, they’ll become crispy and stay this way in the next days (if you manage not to eat them all in the same day– for us at least it’s hard LOL). Another important factor for making great crispy diples is the syrup. The syrup should be a bit thick and is always scented with cinnamon and quite often with orange zest as well. You must not dip the fried diples in the syrup for too long though. They are usually dipped in the syrup, after they cool down, for just one second. Keep in mind that the fried dough should be cooled down to room temperature and the syrup should always be hot. If you plan to serve them on the next day, then you can fry the dough, and keep the diples strips in an open container. On the next day, you can make the syrup, dip them in it while hot, and then serve them, drizzling with lots of honey and crushed walnuts. If you don’t have enough time, then you can also make the syrup a day ahead, and warm it up in order to dip the diples in it, before you serve them. Please never keep the diples in your fridge. They will become soggy. Diples are kept in a humid-free place of your house, uncovered. If you want to cover them, then use a simple cheesecloth or tulle; something that allows the air to circulate. One of the best things about diples, is that they really easy to make. They are also really affordable, a peasants dessert, made with inexpensive materials: flour, eggs, sugar, honey, and cinnamon are the main ingredients. Another thing we love about them is that you can easily make them a day ahead, and make some syrup (or warm up a ready one) and serve them on the next day. This makes them perfect for celebrations when you have a ton of things to do. Along with melomakarona, kourabiedes and Vasilopita, diples is one the most desired desserts during the Holiday Season in Greek households. That is why we included them on our list of Greek comfort foods. So let’s see how to make these amazing festive treats! In the bowl of a stand mixer fitted with the dough hook, add all the dry ingredients (pic. 1): the flour, the sugar, the baking powder and the salt. Mix well with a spoon. If you don’t have a stand mixer, just add the dry ingredients in a large bowl and mix well. Add the beaten eggs to the dry ingredients (pic. 2). Add the orange juice (pic. 3) and the vanilla extract (pic. 4). Add the orange zest (pic. 5). Start your mixer at a low speed (1/3) and let it incorporate everything and knead the dough for about 4 minutes (pic. 6). The dough is ready once it has come together and holds its shape, without sticking to the bowl. If you don’t have a stand mixer, then mix everything together by hand and knead for 5-6 minutes until you get a smooth and only slightly-sticking result. Note: Depending on the flour you used and the volume of the eggs, the dough may be a bit sticky. If it’s too sticky, to the point that you can’t work with it (e.g. it sticks all over your floured hands), add a tablespoon or two of flour and knead for a few seconds. Shape into a ball, and cover with plastic (pic. 7). Let it rest in the fridge for at least 1 hour (we recommend 4-6 or overnight for better results). After the dough has rested, place on lightly floured surface. Lightly dust the dough with flour as well (pic. 8). Divide it into two or four balls (pic. 9) with a dough scraper. Roll a ball out thin (with flour-dusted rolling pin). Try to shape into a rectangle (pic. 10). The thickness of the rolled out dough must be 2mm or less (about 1/16in). Note: You can also use a pasta maker to roll the dough into thin sheets. Using a pasta/dough cutter, cut the excess dough, in order to give your sheet a rectangular shape. Then cut the sheet into 10-15cm X 5-7cm / 4-5in X 2-3in rectangle strips (pic.11, pic. 12). Place each strip on a damp towel (pic. 13), to keep it moist and prevent it from sticking. Continue with rolling out the next ball of dough. Repeat the process until all the dough is cut into strips. Put a large, heavy skillet over medium-high heat. Pour in 4-5cm/2in of oil. To check if the oil is hot enough, you can use a small piece of dough (pic. 14). If it rises to the surface and starts bubbling gently (pic. 15), then the oil is hot enough to fry the diples strips. Gently place a few strips (never more than 2 or 3) in the pan (pic. 16). Fry for about 1 minute, flipping once halfway through, using two forks, until golden. Depending on the oil used and how hot it is, you may even need less than a minute, so keep an eye to check if they’re crispy and golden. Transfer each fried strip (dipla) to paper towel-lined plates to drain the excess oil (pic. 17). You might need more than one because you should not stack them on top of each other but rather next to each other. Let them cool completely. Place all of them on a plate (pic. 18). Start making the syrup: Add the sugar, the water, the cinnamon stick, the orange zest and the orange juice in a small or medium pot/saucepan (pic. 19). Place over medium-high heat, uncovered. Once it starts simmering, lower the heat to low and let it simmer for 5-6 minutes, stirring gently from time to time. Remove from heat and add the honey (pic. 20). Stir to dissolve. Using tongs (pic. 21), dip each fried dipla strip into the hot syrup for just 1 second (pic. 22). You just want them to get coated in syrup, so don’t let them stay in it for long or they’ll become soft and mushy (which is the opposite of the desired consistency for diples). Place in a large plate, in layers, adding ground walnuts, cinnamon and honey in each layer, according to your liking. 1. If you don’t plan to serve immediately, it’s better to keep the syrup aside or in the fridge and not dip the diples in it. Then, right before serving the, you can warm it up and dip the diples strips in it. This way, they’ll stay more crispy. 2. Do not store diples in the fridge or they’ll become mushy. 3. Keep prepared diples in a plate or an open container and cover with cheesecloth if you have to (we often store them in the oven before serving them ourselves). High humidity is their worst enemy. 4. You can make the dough a day ahead and the syrup as well, and simply warm the syrup up, for dipping the diples, before serving them. Do not store either in the fridge before this (or after!). 5. We find that the best way to make diples is to make the dough and fry the diples first and then prepare the syrup. This way, the syrup is still hot when the fried diples have cooled down. 6. You can also serve diples sprinkling with a little powdered sugar along with ground cinnamon. 7. Keep the excess dough you cut when giving the sheet a rectangular shape. Knead all the scraps into a ball and make a few more strips in the end.